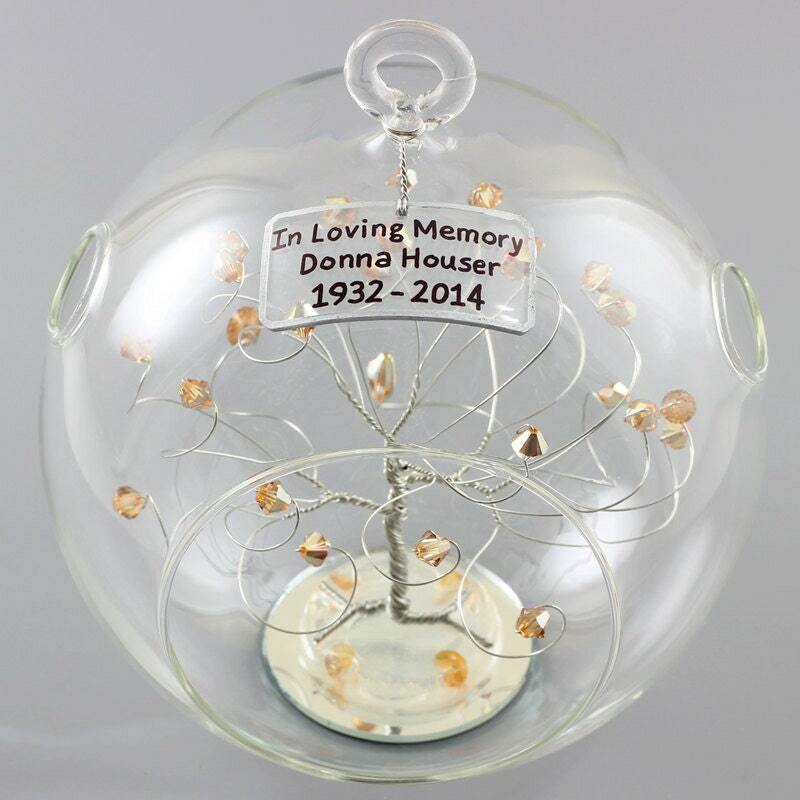 To order your Memorial Ornament just add this listing to your shopping cart. In the cart is a message box where you can note your personalized text. This ornament accommodates up to three lines of text with 18 characters per line including spaces. You can say anything you like within this space. Text will be centered and you can use less than 3 lines. 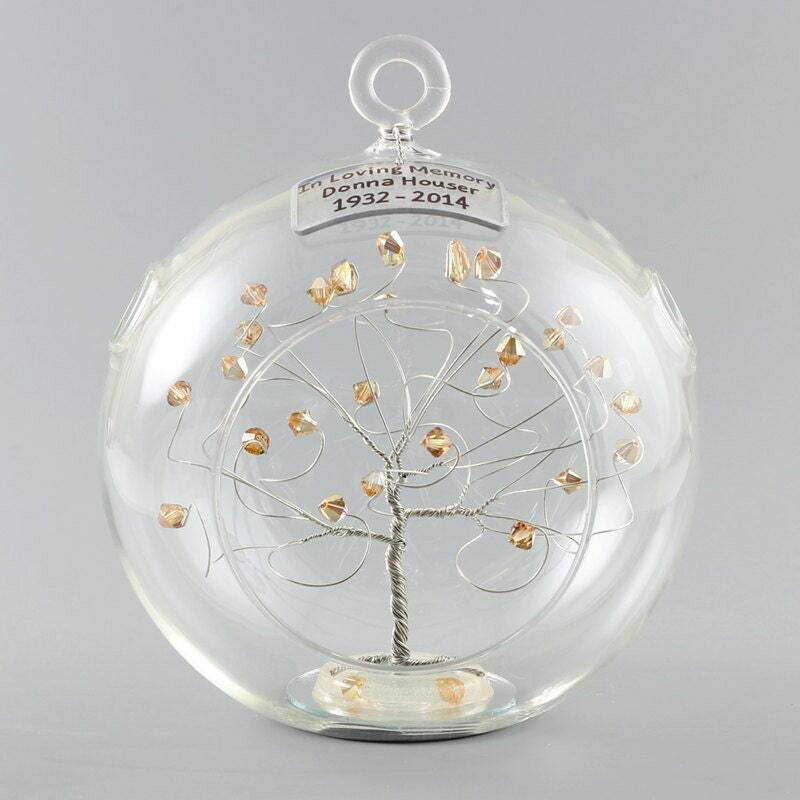 This memorial ornament is created using handpicked metallic sunshine swarovski crystal elements, silver tone wire, and a generously sized glass ball. I selected this bead specifically for my memorial ornaments and do not offer them on my other trees. They are half golden colored crystal and half metallic gold with occasional pink flashes. The 5.5" glass ball features a flat bottom, a hanging loop, and has two holes at the top which are shown in the photos. The sign is handcrafted from acrylic, curved to fit the ornament, and is attached with matching wire. The tree base is resin and matching beads on a small mirror. This is stunning. I sent it to a dear couple when one of their mom’s died right before Christmas. I didn’t expect it to arrive before Christmas, but Apryl came through like a true professional who cares about her client’s needs. They loved it and assured me it’s the most thoughtful gift they received. I’ll buy it again. Maybe even buy one for myself. Absolutely beautiful - thank you!